Debi Adams has been involved in the art industry for more than 30 years and feels blessed to make a living from her passions. Her experience includes sewing, floral arranging, painting, calligraphy, cookie decorating, wedding planning, set & prop staging and photography as well as paper crafting. She has been featured in Somerset Studios and Apronology., as well as a myriad of other magazines and books. 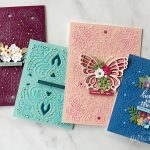 Debi considers herself fortunate to have worked with licensed designers Tim Holtz, Brenda Walton, and now, Seth Apter. A teacher by degree but an artist at heart, she has taught classes locally and internationally, traveling as far away as Portugal and Australia. A California native, Debi has recently relocated/runaway to Arizona. She loves spending time with her four grown daughters and junkingÂ at garage/estate sales and thrift stores. 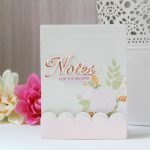 You can view her work on her blog and here on the Spellbinders’ blog. What’s your design/craft story? ie. How’d you get started? Interestingly enough, I got involved with arts & crafts in the 6th grade. Having moved to a new city and a bit shy, I turned to art because I found it was a non-competitive way of expressing myself without having to really put myself out there. Wow, I never verbalized that before! Lol! Anyway, I was introduced to art, specifically pastels and floral arranging by my Bible Study leader, Jo Mellender. I will never, ever forget her impact on my life. Oh my gosh, I have been exposed to such amazing people and trends! All have had an influence in both what I create and how I create it. I never want to stop learning and pushing the boundaries. I love to do cutesy to mixed-media and everything in between. I guess you would say I’m very passionate about art! Guess I didn’t answer the question, huh? I would say my style has become so much more diverse. I love being able to run with trends and then seeing them all come to fruition. It was a challenge just to pick the direction I wanted to go because there is just so much out there! Ah…decision-making! The hardest part was making sure everything worked together. I sure learned a lot and would change a few things the next time but for the most part, I’m just excited to play with all of it. I really wanted to design art that would reach a younger demographic. Having grown children/friends in that category was definitely a plus. I picked their brain a lot! Simplicity is the key. What/who doesn’t really inspire me? Honestly, art is all around us! Stores like Anthropologie , West Elm & Target who either create the trends or display them definitely deliver the artistic goods. I love looking at small boutique-type stores that have unique window/store displays. I look at magazines-all kinds. Photos and photo backdrops are inspirational for their unique layouts. Fabrics, particularly from Japan, have amazing color combinations and style-sense. Did I mention I love flowers too? No two flowers are the same and they all are so diverse. Even the Arizona desert, where I now reside, offers a plethora of colors, styles and textures. Obviously, people have had a huge influence on me as well. I have played along side Brenda Walton, Seth Apter, Sharyn Sowell and Tim Holtz. Each has his/her own look and feel and they do influence how I take on a particular project however, the interpretation is my own. And, I look at lots and lots of blogs, particularly those with younger artists and audiences (Em Henderson, Lauren Conrad, Urbanic Paper) because they are our new trendsetters. I have taken classes at the French General in L.A from millinery flower making, felting and jewelry making to calligraphy from Oh Hello Friend in Fullerton, Ca. to give me a broader base from which to draw from. All of these are inspirational. And you know, just some awesome music creates a happy place too! Debi’s Collection will be available for purchase in early 2016. 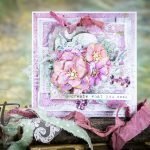 Spellbinders will be live on Periscope interviewing Debi about her NEW mixed media collection and what’s next on her radar. AND We are giving away 2 “tricked out” Platinums that have been decorated by our designers.